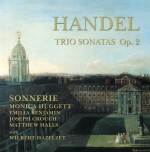 Monica Huggett and her ensemble Sonnerie scored a hit on Avie with their recording of Handel’s Trio Sonatas, Op. 2 (AV 0033). They continue their traversal of Handel’s chamber works with the Organ Concertos, Op. 4. 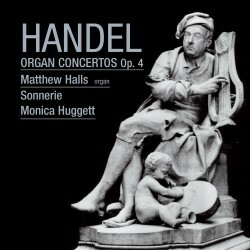 Matthew Halls is the brilliant soloist who spins out Handel’s endlessly tuneful works with an improvisatory flair that the composer – himself a virtuoso organist – would surely have approved. Halls was Assistant Organist at New College, Oxford and Director of Music at the University Church before playing harpsichord with the European Union Baroque Orchestra in 1998. Since then he has played with many of Europe’s leading period instrument ensembles, including Amsterdam Baroque Orchestra with Tom Koopman, English Baroque Soloists with Sir John Eliot Gardiner, and the King’s Consort. 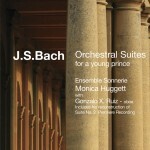 As a member of Sonnerie, he has appeared at the Wigmore Hall and at Festivals throughout Europe. Matthew is also active as a conductor and is currently assistant musical director of New Chamber Opera. On this recording, he plays a replica of a Baroque style chamber organ, built by Jaap Fama and Henk Klop, and owned by the Dutch Bach Society.